Rated R for strong action violence, a scene of sexuality and some language. Sometimes the associations we attach to movies make it more difficult for us to objectively judge those works. For example, I maintained a negative impression of Highlander for years because I knew a dorky guy who thought it was this amazing movie. I connected the film with this nerd, so I got it stuck in my head that Highlander was not a good film. Anyway, despite my prejudices, it turned out that Highlander actually provided a rather exciting and visceral film experience. Directed by music video veteran Russell Mulcahy - known mainly for his groundbreaking work with Duran Duran- it bore the marks of such an association; Highlander used a style of quick cutting that was unusual for the era. This was one of Mulcahy's first feature films, and he displayed a surprisingly self-assured hand in leading this potentially confusing story through to its conclusion. That latter area really could have killed Highlander, since the movie frequently hopped from plot to plot and from time period to time period. It easily could have lost the viewer amidst all of the gyrations. Happily, that never occurred, and the movie seemed surprisingly coherent and tight. I can't say that it never became muddled, but since few science fiction stories remain perfectly coherent from start to finish - especially when those tales involve multiple time periods - I won't criticize Highlander for similar flaws. One area in which Highlander excels involved some of its performances. In their supporting roles, Sean Connery and Clancy Brown were terrific. Connery played the mentor to protagonist Connor MacLeod (Christopher Lambert) and provided his usual charming and powerful persona. We saw less of Connery than I'd like, but he added a nice spark to the film and made it much more satisfying. As MacLeod's nemesis Kurgan, Brown stood out as a sadistic, demented and amoral villain. He's tremendous fun to watch while Kurgan became scarier and scarier as the film continued. Most movie baddies remain fairly tame, but Brown was tremendously creepy in the part. He made an underwritten role more compelling than it should have been. As for Lambert himself, he's never been much of an actor, and nothing he did in Highlander altered my opinion of his skills. Still, he looked good in the part, and he acquitted himself well enough. Another actor could have made MacLeod more stimulating, but Lambert did nothing to embarrass himself or to hurt the film. Mulcahy maintained a nicely kinetic visual style throughout Highlander. Many of its action scenes sizzled with excitement due to his perceptive eye. Highlander isn't one of the best action films I've ever seen, but it's a very stimulating and enjoyable effort and one I shouldn't have neglected for so many years. 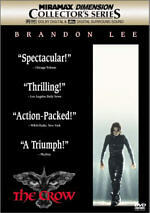 Note that this DVD of Highlander includes the �Director�s Cut�. This adds about six minutes of footage not seen in the US. The theatrical version of Highlander has never been available on DVD; only this cut exists in that format. 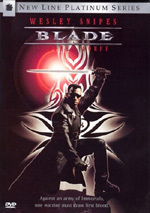 Highlander appears in an aspect ratio of approximately 1.85:1 on this single-sided, double-layered DVD; the image has been enhanced for 16X9 televisions. Many DVD fans regard the original Highlander release as one of the all-time worst in regard to its picture quality. While certainly flawed, I never felt it seemed that terrible. Nonetheless, I looked forward to this new release, as I hoped it�d offer a significant improvement over the old one. While Anchor Bay�s new DVD did seem stronger than the original, unfortunately, it failed to provide any substantial growth. This disc fixed some problems but introduced a few of its own. Sharpness declined from the old DVD. The new one seemed reasonably crisp and detailed much of the time, but it also displayed moderate softness periodically. The image never became terribly fuzzy, but it appeared less well defined than I expected, and the original disc showed stronger delineation. However, it suffered from some significant examples of jagged edges and moir� effects; the picture really strobed at times. That didn�t occur here, but the new release showed mild edge enhancement I didn�t notice on the original; that issue likely caused the softness I noticed. The biggest problem observed on the old disc related to print concerns, particularly grain. The new one remained rather grainy much of the time; it seemed to reduce levels a little, but those elements continued to distract during the Anchor Bay release. However, this one did clean up the grit and speckles that marred the original; I saw a couple of bits, but they showed nowhere near the intensity on the prior disc. For the most part, the new Highlander came across as clean other than the distinct grain that appeared so much of the time. The new DVD displayed stronger mastering. The original showed a digital, �edgy� look that made it look odd. The Anchor Bay release lacked that problem. It seemed tighter and showed none of the artifacting present on the original. One area in which the new DVD faltered related to colors. The Anchor Bay disc showed decent hues at times, but for much of the film they seemed somewhat flat and muddy. The prior disc usually displayed nicely vivid and lively tones, but they appeared toned down here. I thought this made the image come across as mildly flat and bland. Black levels appeared reasonably deep and rich on both releases, and shadow detail also seemed fairly clear and appropriately visible. However, the old disc looked noticeably brighter and more vibrant. The Anchor Bay package came across as somewhat murky and muddy at times. Overall, the picture of Highlander seemed watchable, and it did improve on the old release, but it didn�t offer a huge leap. Unfortunately, the new image transfer comes with a less effective soundtrack. The Anchor Bay release provides both Dolby Digital 5.1 EX and DTS ES 6.1 mixes. Frankly, I detected no significant differences between the two; they seemed largely identical. Unfortunately, both the new tracks also appeared moderately inferior compared to the Dolby Digital 5.1 mix heard on the original disc. Some of the concerns related to the soundfield. The audio heard on the Anchor Bay disc showed a broad presence, but it usually sounded fairly �speaker-specific� and sterile. The track displayed a good sense of general ambience, but when more precise information appeared, it frequently appeared too heavily localized in various channels. At times the audio demonstrated good movement and blending, but much of the time I felt the various elements appeared to exist in moderate isolation from the others. However, I do need to acknowledge that the mix offered a much more lively soundfield than usually found on a flick from this era. The track used all five speakers to an active degree. The rear speakers even kicked in with a reasonably amount of split-surround material; for example, a gunfight showed solid spread and distinction in the back speakers. Without something against which to compare it, I might have felt more impressed by the soundfield. However, since I knew the track from the old disc, the Anchor Bay edition seemed less impressive. It seemed noticeably better integrated and smoother. Elements meshed together in a more seamless way, and it still manifested good split surround material. To be frank, the differences weren�t enormous, as even the old mix showed some �speaker-specific� tendencies at times, but I still thought the new tracks worked less well. The same went for the audio quality, which showed problems not heard on the old DVD. Dialogue seemed similar for both, which meant the same pros and cons. At times speech was clear and warm, but on many other occasions dialogue sounded muted or muddy or even muffled; the volume level of the speech could vary a great deal. After that, the two DVDs demonstrated discrepancies. On the new one, effects often seemed muted and flat. They showed little distortion, but they also offered little spark or brightness much of the time. For the most part, the effects remained somewhat dull. Music also came across as subdued and fairly indistinct during much of the film. The Queen songs still showed the excessive reverberation present on the old DVD, but Michael Kamen�s score also suffered from a bland and tentative presence. Bass response seemed loud and boomy; low-end lacked much definition or tightness. The original had some of the same concerns at times, but for the most part I felt the bass of the old disc appeared tauter and clearer. While I can�t say that the Anchor Bay DVD�s audio seemed lacked a massive step backwards, I did feel the original release�s soundtrack provided a more vivid and involving experience. Although the �Immortal Edition� of Highlander looks like a two-DVD set, it�s not. Nonetheless, we get a few nice components, some of which also appear on the old release. Actually, one of the few duplicates is an audio commentary from director Russell Mulcahy and producers Peter Davis and William Panzer. I found this to be an unusually interesting and entertaining track. The participants were much more frank and critical of the project than we normally hear; they weren't at all afraid to knock parts of the film and really could offer some good insights. Mulcahy dominated the track and displayed an unfortunate tendency to speak over the others, but all three contributed compelling tidbits. Chalk this one up as a very solid and honest commentary that's definitely worth a listen. Within the Queen Music Videos section, we get three tunes. �Who Wants to Live Forever� lasts four minutes, five seconds, and shows the band as they lip-synch along with an orchestra and choir. �A Kind of Magic� goes for four minutes and 20 seconds. Freddie Mercury brings transmogrifies some objects and people with his sorcery and they lip-synch the tune. For the most part, the three-minute and 40-second �Princes of the Universe� just consists of simple band lip-synch, but Christopher Lambert makes a guest appearance as well. He skulks around the stage for a couple of shots and also engages in a very brief sword fight with Freddie. The songs seem dated and blah, and the videos are no better. Oddly, Anchor Bay chose to provide anamorphic enhancement for all of these, even though they use a 1.33:1 ratio. Within the �Still Galleries� area, we find two subdomains. The Poster and Still Gallery includes 126 images. Mainly these consist of shots from the movie; we also find a few behind the scenes pictures plus a few frames of advertising. The �Poster and Still Gallery� provides a big change from the old DVD�s selection of materials. That disc included about 875 frames of information. Unfortunately, they encoded it in a very poor manner, which made it tough to access, but nonetheless, the package provided a wealth of useful information. Most of that fails to appear here. Frankly, the pictures aren�t very interesting. In the Queen Still Gallery, we get 32 images. It includes shots from the three videos found elsewhere on the DVD as well as a few behind the scenes pictures and some record covers. It�s a pretty bland collection. The Trailers area provides two ads for the film. This improves upon the old DVD slightly; it featured only one promo. Talent Bios includes three very solid entries for director Mulcahy and actors Lambert and Connery; the listing include a lot of useful notes and are much better than the average glorified filmographies. Weblinks just offers access to the official Highlander and Queen pages; no true DVD-ROM content appears here. Within the 24-page Collector�s Booklet we find a mix of information. It provides short but interesting production notes by Rand Vossler; he covers the project�s origins, the shoot, and its afterlife in a quick and efficient manner. Andy Mangels writes additional comments about Queen and their involvement in the project. Finally, some artwork, photos, and merchandising ads appear - excuse me while I rush to buy that $495 �Christopher Lambert Signature Sword�! Although much longer than the booklet included with the original DVD, it omits a couple of things found there. That one listed a quick note from Mulcahy and a "Summary of the Remastering Process". I didn�t miss either; the new booklet�s much nicer. Highlander includes the THX Optimizer program. Also found on The Evil Dead and Heathers, it purports to help you set up your home theater to best present the movie on the disc in question. Apparently the Optimizer is unique for each DVD on which it�s included; unlike programs such as Video Essentials, the Optimizer should tweak your set-up differently every time. Frankly, I�ve been very happy with my already-established calibration and I�m afraid to muck with it, so I�ve never tried the Optimizer. If you lack calibration from Video Essentials or a similar program, or if you�re just more adventurous than I am, the Optimizer could be a helpful addition. 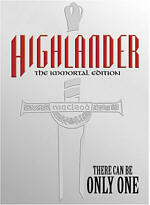 Anchor Bay offer two different DVD versions of Highlander. This review covers the more deluxe �Immortal Edition�, which lists for $39.98; they also sell a �Regular Edition�, which retails for $14.98. How do they differ? The �Immortal Edition� adds the still galleries, the Queen music videos, the 24-page booklet, and the �Companion CD�. It also comes inside a nice metal slipcase. That doesn�t seem like much added material for an additional $25 list. The �Immortal Edition� appears best suited for the big Queen fans; they�ll want the music videos and the version of �One Year of Love� that doesn�t look to be available elsewhere. Those partial to Highlander but not Queen won�t find enough here to warrant the extra money. Highlander offers a fairly entertaining film. While not a classic, it certainly shows a lot of flair and creativity, and it works well as a whole. This new DVD improves upon the old one�s oft-despised picture, but don�t expect a revelation, for it has its own problems and seems decent at best. Audio quality actually dips a bit, as the prior DVD seemed to provide clearer and better-integrated sound; the drop isn�t large, though, and these new mixes appear acceptable. In regard to extras, the Anchor Bay versions of Highlander adds a few modest pieces but loses most of the excellent still gallery from the original disc. The new materials will appeal mainly to Queen fans, as they don�t tell us much about the movie itself. 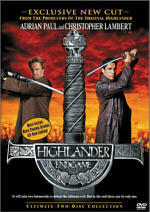 I definitely recommend Highlander, for it�s an entertaining and exciting little flick. However, I�d steer most fans toward the less expensive standard edition from Anchor Bay. It offers picture and sound quality identical to those seen on the costlier �Immortal Edition�, and it only sacrifices a few minor extras. If you adore Queen, go for the bigger package, but others should save the bucks and go for the regular release, which is a serious bargain at only $14.98 list.